See it, hear it, taste it, smell it, touch it – in short, take it in with all the senses. What? 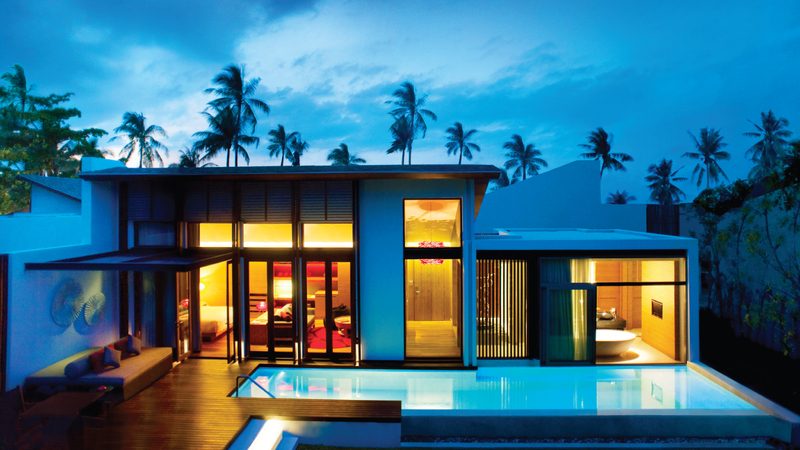 Luxury lifestyle on the tropical paradise of Koh Samui. We take you on a sensual journey to its five most lavish resorts. Tucked within a forested hillside and sloping down to an immaculate white sand beach, Vana Belle – a Luxury Collection Resort by Marriot International, is an oasis in an area of prime convenience. 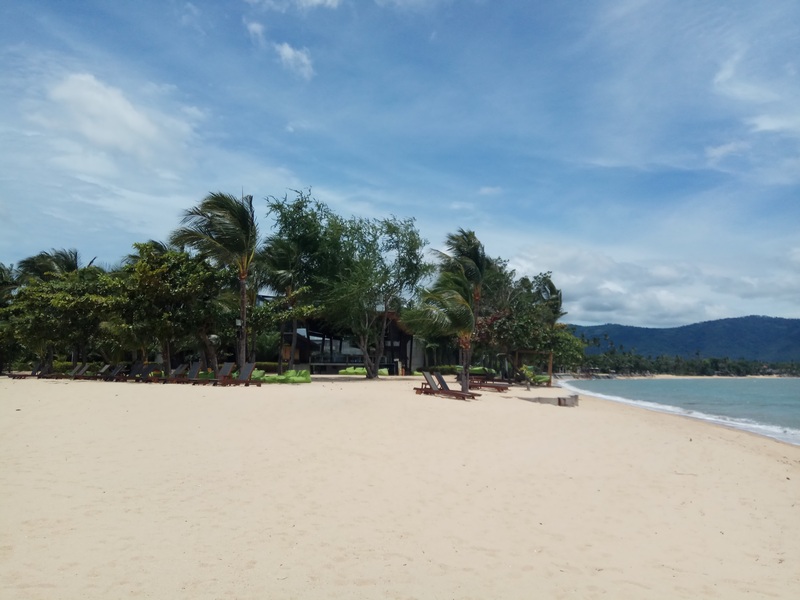 Located just minutes away from Chaweng, Koh Samui’s biggest commercial center, the resort is close enough to the hubbub yet far enough to feel calmly secluded, immersed in nature, and away from it all. 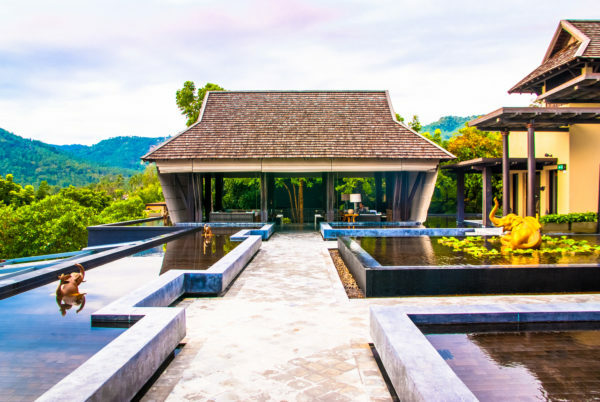 The 80 suites and villas in this jungle oasis were designed with Thai-inspired architectural touches that blend handsomely with natural surroundings, and each one has its own private pool. But this setting is only the beginning, a visit to Vana Belle guarantees a pampering for all the senses, but first and foremost – taste. The star of the show is Kiree, a restaurant perched on the hillside, commanding a spectacular view of the Gulf of Siam and recently included in Thailand Tatler’s Best Restaurants 2017. One of the main attractions of the venue is Vana Belle’s highly vaunted Saturday Brunch. Tantalizing dishes from around the world have been seamlessly curated to form this unique brunch experience. We were delighted to find French oysters, Phuket lobster, Serrano ham and Australian Wagyu rib-eye along with various cheeses, salads and the requisite line-up of classic breakfast items. 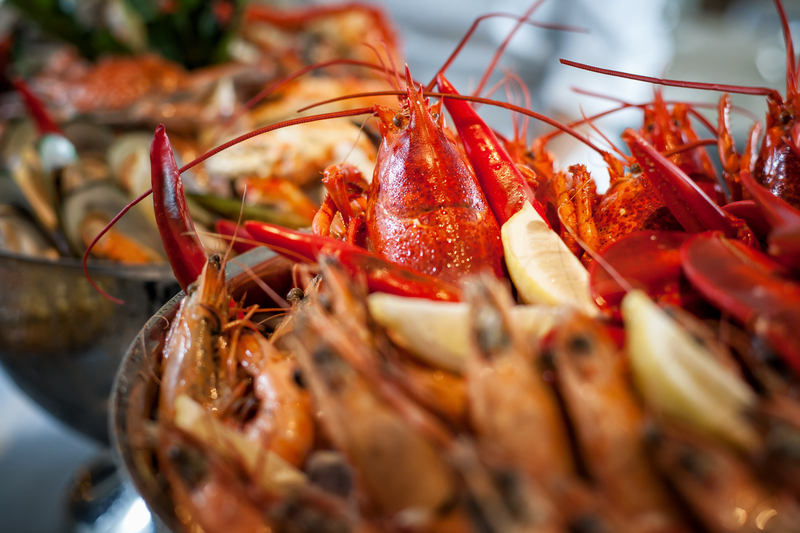 The buffet also offers a wide selection of fresh fruits, seafood, meats, patisserie favorites, yogurts and juices. There’s also an entire mini-buffet of decadent desserts, including Valrhona chocolate delicacies and even a chocolate fountain with an assortment of fruit and biscuits to dip. A collision with taste at Vana Belle continues at dinnertime. The dinner menu showcases the richness of authentic Southern Thai cuisine while including some of the highlights among central and northeastern Thai dishes. 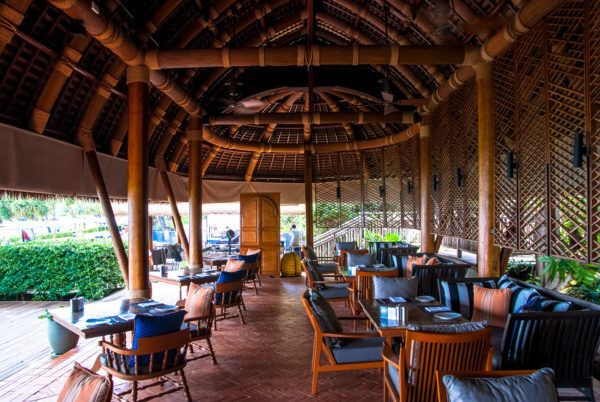 Chef Nattanan Deeruang, the mastermind behind the resort’s signature Thai restaurant, is passionate about the farm-to-table sourcing of the island’s freshest ingredients, and transforming them into unforgettable Thai culinary experiences. Nattanan is always searching for, and experimenting with, new recipes, and believes every dish must engage the key senses. Thai food is known for its careful balancing of four fundamental flavors; sweet, sour, bitter and salty. ‘Spicy’ often embellishes this balance, but the further south you go, the more fundamental spicy becomes. In the south, a dish that isn’t spicy will be considered bland. 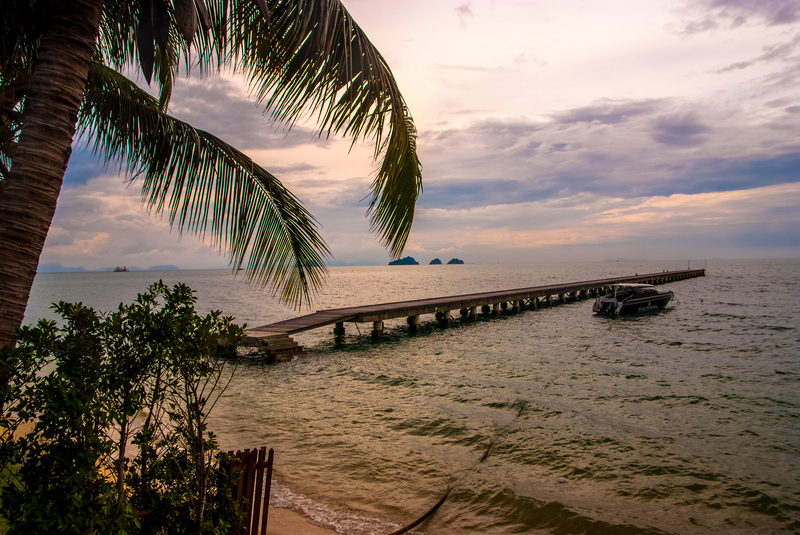 Southern Thailand cuisine also has a strong emphasis on seafood with its proximity to the Gulf of Siam and the Andaman Sea. The standouts on the menu at Kiree follow the southern style and include Pla Neung Ma Now, sea bass with spicy lime sauce steamed to perfection, and Gai Phad Bai Yee Ra, stir-fried chicken with spicy curry paste and wild tree basil. This dish has an exciting peppery flavor that comes from the wild tree basil. Gaeng Gai Meng Prow, a more gently flavored soft coconut shell curry with chicken is a mouth-watering recipe, made with fresh young coconuts. Bai Liang Phad Kai, or stir fried liang leaves with egg, was personally recommended by the chef and made a pungent and savory impression that tickled the taste buds. Almost all the dishes at Kiree can be adapted to taste upon request, so don’t be intimidated by the strength of southern spices. For dessert, we tried the Kanom Mor Gaeng Bai Toey, a roasted mung bean crème brulée with pandan-leaf flavor. The smooth crème brulée has a contrapuntal exquisiteness in combination with the crunchy water chestnuts. It’s not too sweet so the toasted coconut shavings on top with a sprinkling of coconut sugar add just the right tone. The next morning Vana Belle’s buffet breakfast provides further thrills, both in a buffet form and with an inspiring selection of cooked to order epicurean delights which can be found on the a la carte menu. 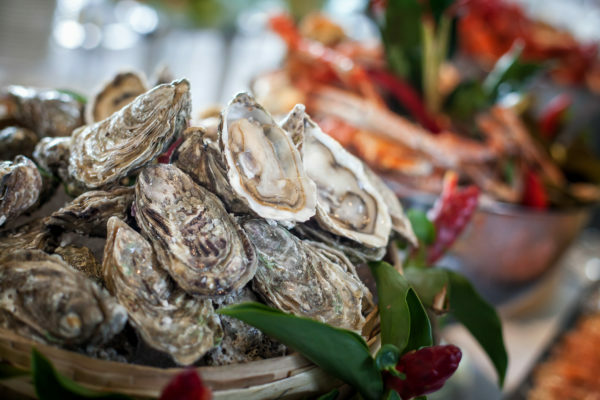 One special touch are fresh raw oysters and chilled prosecco, available along with all the classic breakfast items. Oyster and bubbly? This must be our favorite breakfast on Koh Samui, if not in Thailand! Kiree is open to both in-house guests and visitors and advance reservations are highly recommended. It is one of Samui’s best kept secrets, with a location that brings together central convenience and the charms of a hidden hideaway, with its hillside grove and untouched beach below. 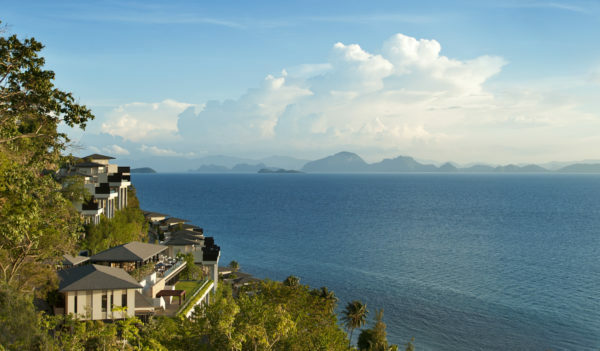 Nestled in a secluded bay on the northwestern tip of the island, the Four Seasons Resort Koh Samui delivers the most powerful of first impressions, with the sheer beauty of its panoramic vistas. Your eyes will drink up the scenery at every turn. Look seaward and behold the white sandy beaches set against a blue backdrop of sky and sea. Turn around and be struck by the harmonious beauty of the resort’s villas that bejewel the lush hillside. 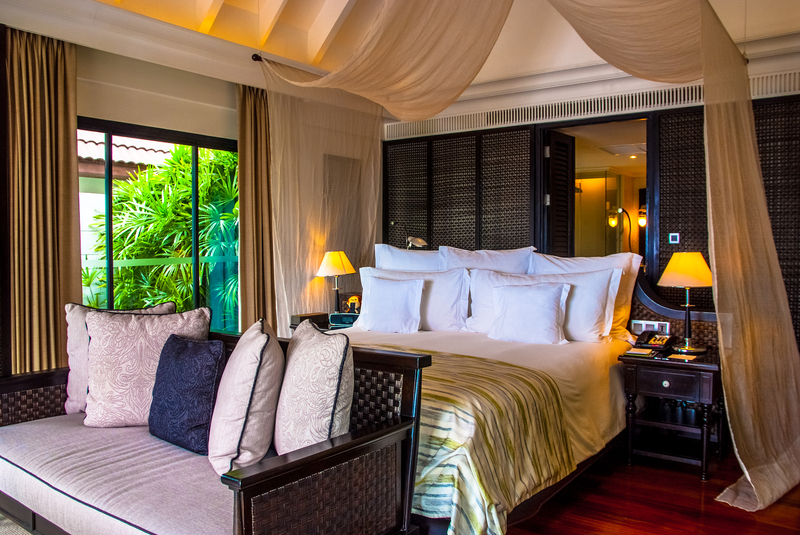 Designed with a fidelity to traditional Thai architecture and integrating almost organically with the lush foliage of its surroundings, Four Seasons Resort Koh Samui is an island within an island, concentrating the best of the natural beauty and local flavors into a serene oasis, away from the hubbub of the island’s bustling townships. 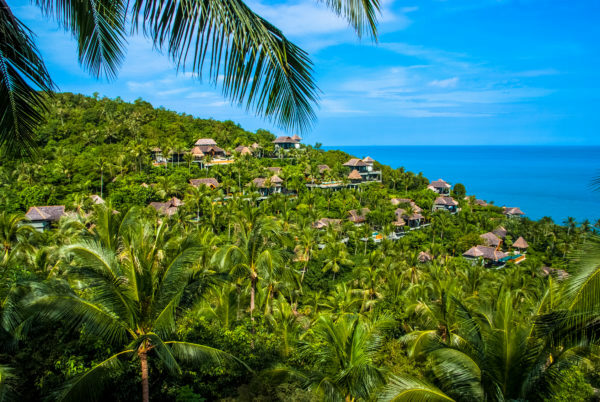 The resort was formerly a coconut orchard and many of the coconut trees have been preserved, providing a scented canopy interspersed with charming botanical arrangements, which make strolling a pleasure. 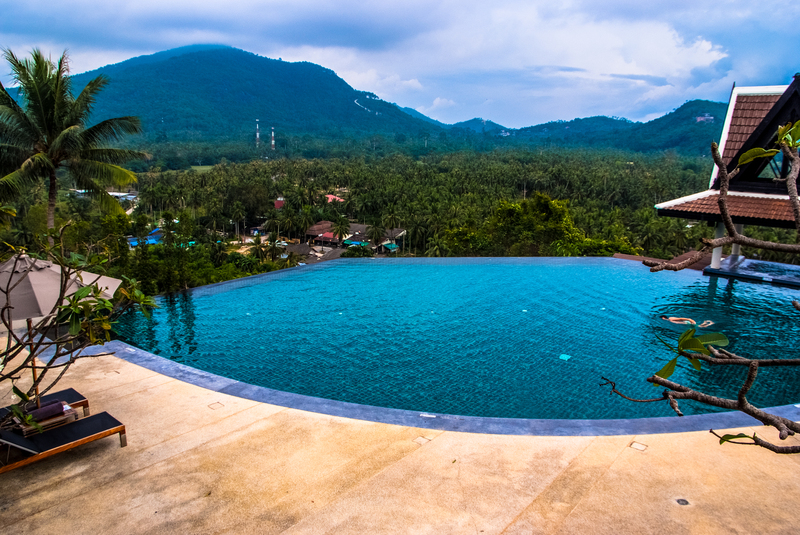 With over 70 villas, all with private infinity pools, the resort offers both the ideal romantic getaway for couples as well as all the comforts and amenities a family requires. 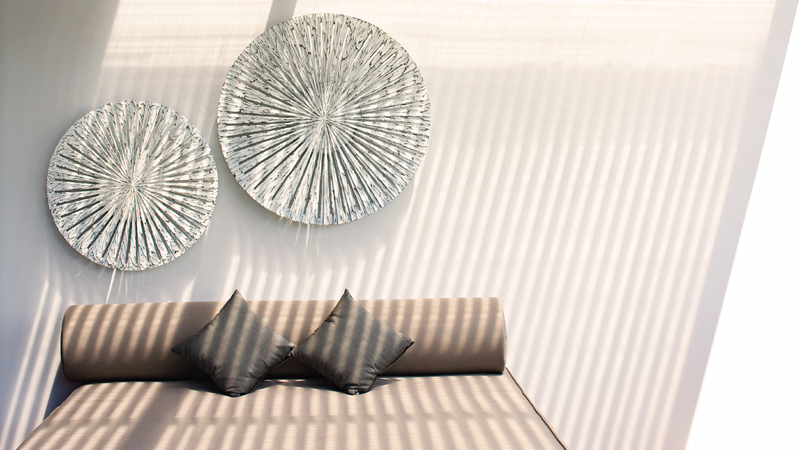 The chic interiors feature island inspired accessories and local accents in everything from the fabrics to the furnishings. Spacious and aesthetically pleasing, the rooms include custom crafted bathtubs and playful touches like the ornamental bed canopies. Dining at Four Seasons is also a visual experience. The KOH Thai Kitchen & Bar, set atop a breezy hilltop, allows one to enjoy culinary delights while seated on an open terrace, with a panoramic view of the palm groves and the ocean. Taking in the view in the early morning, while indulging in a breakfasting, is an invigorating start to the day and the afternoon tea with an array of gourmet items is no less pleasurable. The dinner menu adds a modern twist to popular traditional dishes of the Southern Thailand. 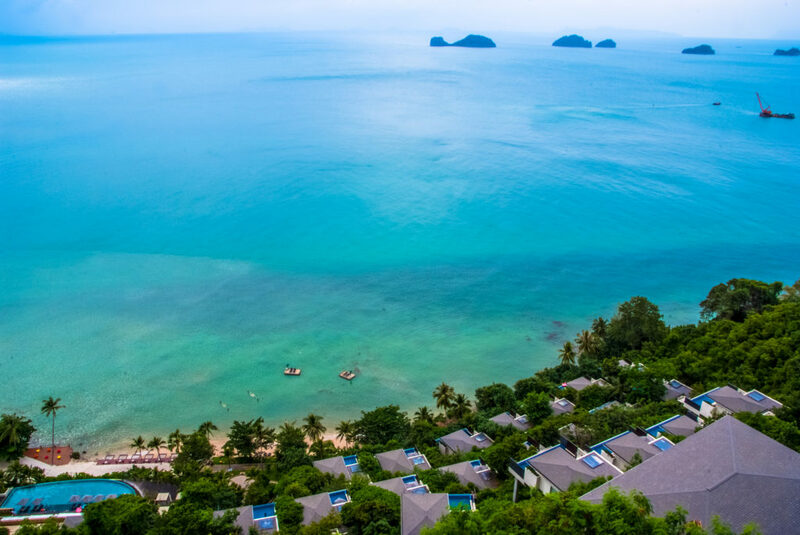 While KOH Thai Kitchen & Bar is perched at the apex of the resort, down below, on the pristine private beach are CoCoRum and Pla Pla restaurants. CoCoRum bar and restaurant is situated beside the resort’s main infinity pool, just meters from the seashore, providing a most romantic setting, with its proximity to magical sights, tranquil sounds and alluring scent of the sea. One can dine at the long bar or at the tables in front of a small stage, where occasional live music adds to the ambiance. CoCoRum specializes in rare and artisanal rums from Latin America with a selection of over 150 different labels. A few meters away from CoCoRum is the more traditionally designed restaurant Pla Pla, which offers a fine selection of Mediterranean style seafood dishes, and a Spanish paella night every Friday. The resort also offers guests a chance to be pampered at its Secret Garden Spa, a sanctuary within a sanctuary. Among its signature massages, we tried the 90-minute Samui Fusion, a dynamic massage that stretches the body and gets the blood flowing, using a combination of herbal oils and an invigorating fresh ginger paste. 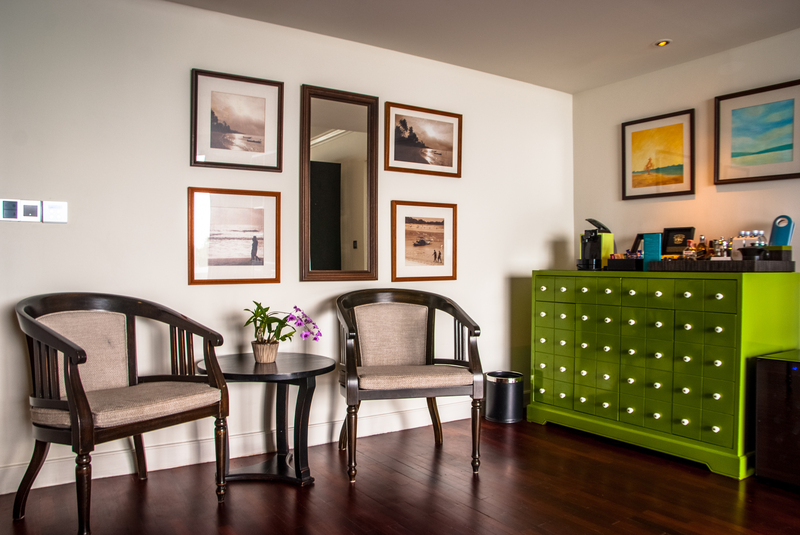 The spa also features a charming reception area, with crystals, aromatherapy and Thai woodwork designs. 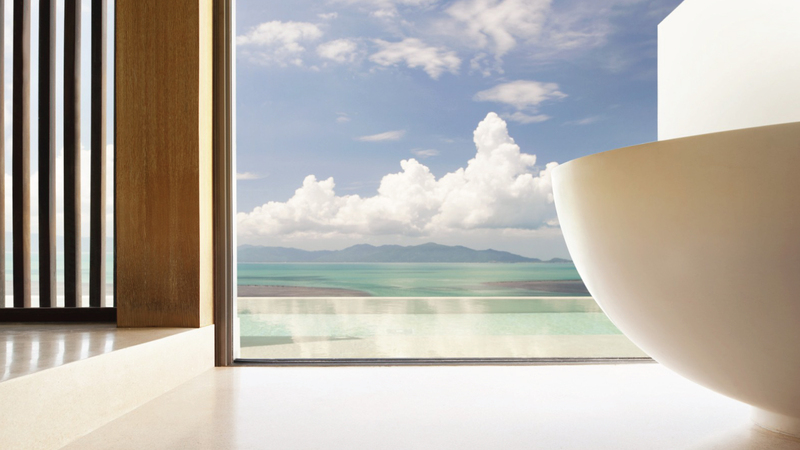 Four Seasons Resort Koh Samui satisfies all the senses and excels in sight, with some of the most spectacular views, both looking out and looking in. If you’re looking for premium exclusivity, intimacy, and obsessive attention to detail, all within a secure setting with spectacular vistas, look no further. Located on the northern coast of Koh Samui, W Koh Samui encompasses nine miles of tropical paradise capped by one of the most pristine beaches on the island. 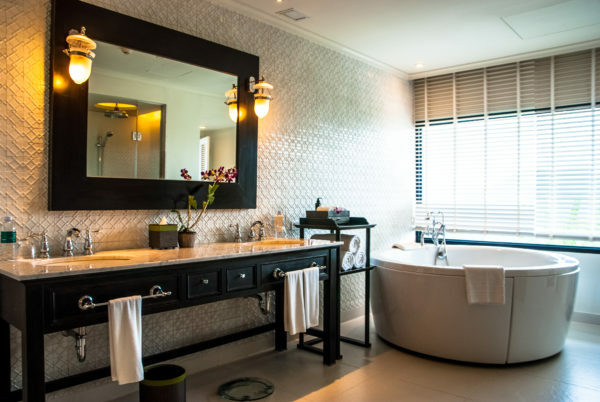 The resort comprises 74 all private pool retreats, each offering cutting edge design and equipped with every convenience, including a state-of-the-art entertainment system, blue tooth speakers, a gorgeously contoured bathtub and both indoor and outdoor showers. 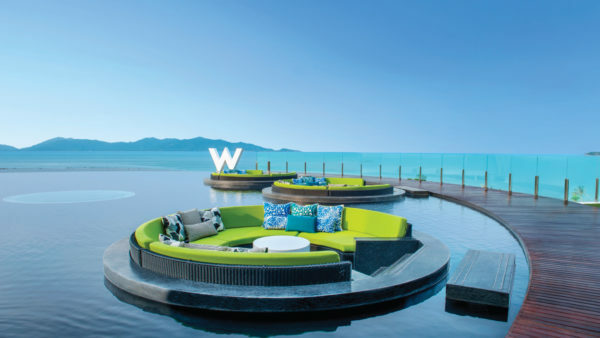 W Koh Samui also has on its grounds six restaurants and bars that offer chic modern design, a distinctly contemporary vibe and a dining and drinking experience of a high caliber. A decidedly less traditional aesthetic than the Thai-influenced designs of other luxury resorts on the island, W brings ultra-modernist touch to Koh Samui and captures a younger sensibility in all its nooks and crannies. And while it excels in all of the five senses, sound is what distinguishes this luxury resort from the rest of the pack. On entrance to the wide lobby, the first thing that catches the eye and the ear is Woobar. Situated just behind the lobby on a sea view deck, this iconic outdoor bar blessed with its own pond, blends almost seamlessly into the sea beyond it. Woobar draws crowds of visitors each day, especially in the afternoon. 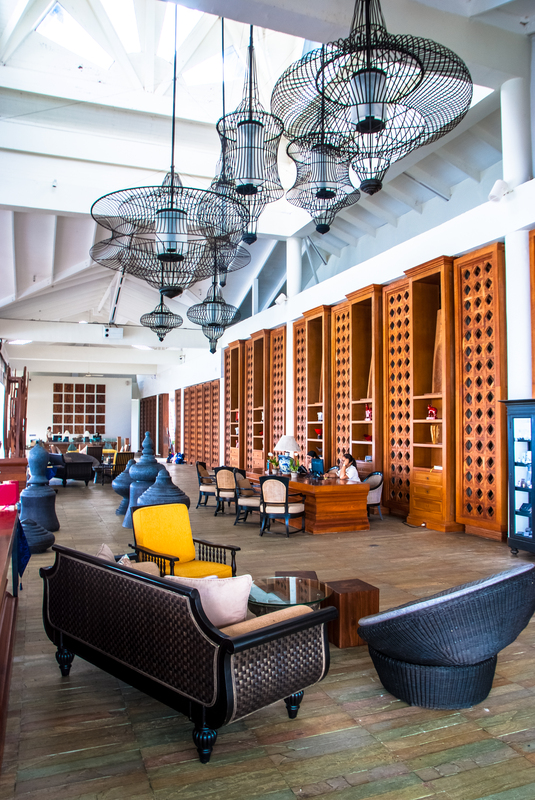 Unlike the often empty bars one finds in other island resorts, Woobar maintains a lively atmosphere, with young travelers dropping in for a signature cocktail. The chill-out lounge sounds of W’s in house music curator Armando Mendes immediately set the tone for this chic contemporary experience. W soundtrack introduces a measure of upscale urban clubbing into the contours of a luxury resort, allowing guests to meet and mingle should they so choose. Mendes is musically rooted in jazz, funk and house music. Born in Oporto, Portugal and a student of engineering and electronic music production, he has played in private events and clubs all over Europe, Russia and Asia. After four years as a resident DJ at the outstanding W Barcelona hotel, and a summer residency at W St. Petersburg, he moved to Thailand to take up his new position at W Samui. The resort also has several other resident DJs on hand, and special DJ pool party events throughout the year. Music is also present at breakfast served at the W’s The Kitchen Table restaurant. The food enjoyed on the plush, high-backed sofas with the sweeping beach views and Kruder and Dorfmeister tracks play pleasantly in the background is bound to make your day. Afternoons are well spent on W’s semi-private beach, one of the prettiest on the island. 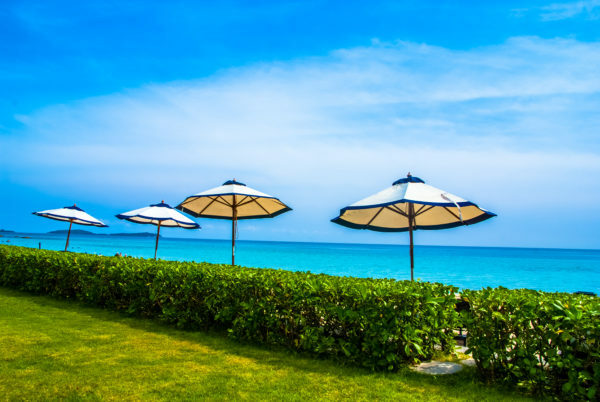 The resort provides breezy hammocks, chaise lounges, sun beds, and umbrellas while the W Beach Grill offers up some of the island’s best beach comfort food. The gentle riffs of summer lounge music from the bar complete the signature W vibe, meshing with the sounds of the surf and water sports. But the real climax to the day is an evening visit to W’s Japanese fine dining venue, Namu, which takes its name from the Korean word for wood. With its modern and minimalist design, the stage is set for a refined and innovative culinary experience. This is Japanese contemporary cuisine at its best, preserving intrinsic tastes while bringing in culinary influences from around Asia. 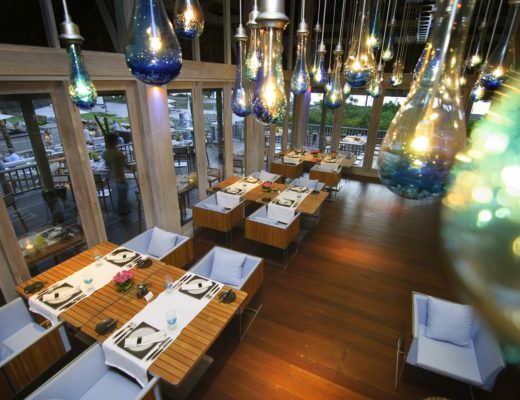 Pairings with a selection of fine chilled sake make Namu one of the most memorable encounters with food on the island. Scheduled to check out the next day but loathing to do so, we used a linguistic loophole to instead check out W’s afternoon infinity pool party at WET. Spinning tunes was DJ Mark Doyle, founder of the UK-based label Fierce Angel. He had the scantily clad young crowd dancing, dipping and dripping while the next-door sunset bar SIP fueled the party mood with refreshing cocktails and crafted beers. With the music in our heads, we finally tore ourselves away from all the fun, and got ready for our next adventure. 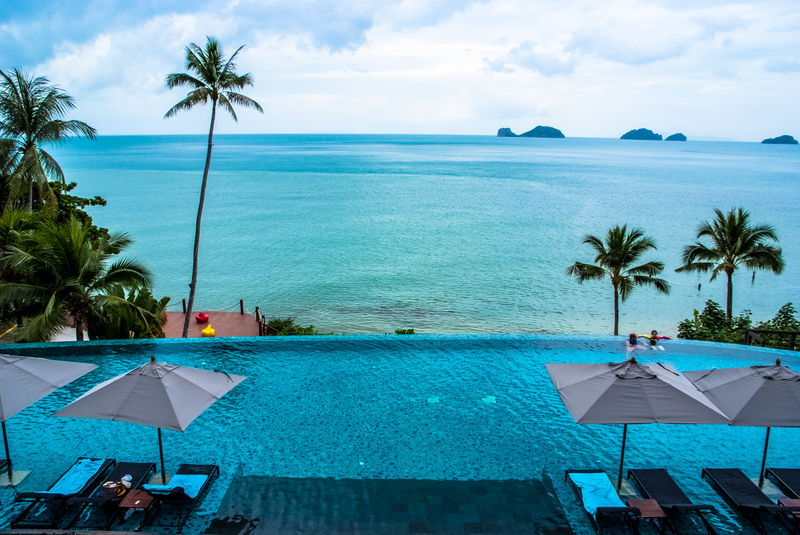 Entering the cliff-perched lobby of the InterContinental Samui Baan Taling Ngam Resort for the first time is a breathtaking experience. 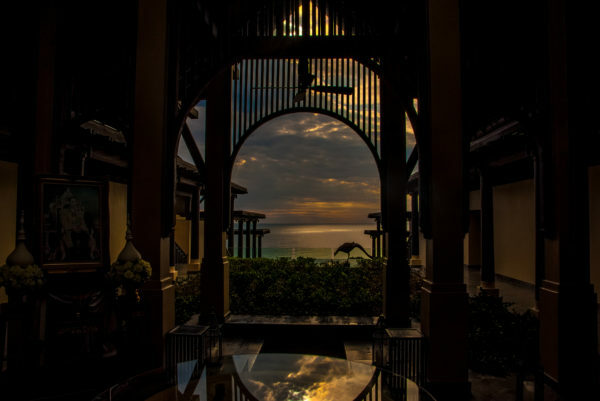 The combination of the architecturally elegant features of the lobby with the wide and spectacular vista of the western Gulf of Siam, leaves one mesmerized. 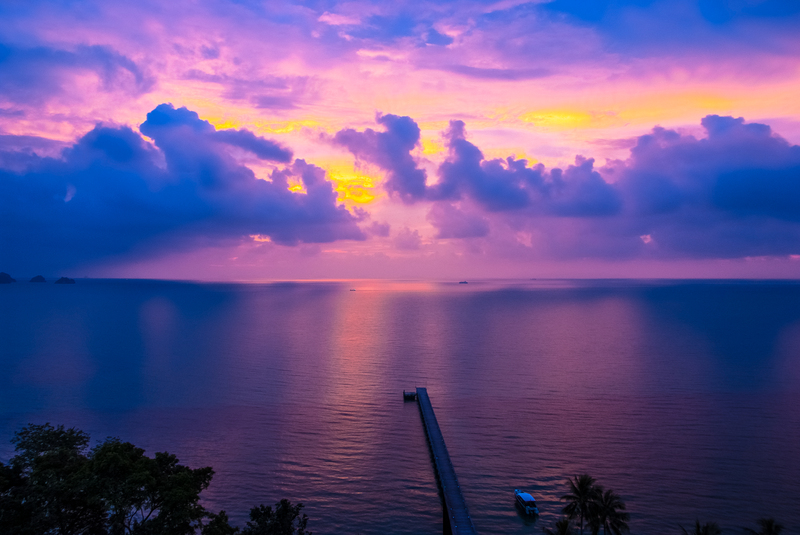 Included in the New York Times No.1 Best Seller “1,000 Places to See Before You Die,” Baan Taling Ngam Resort offers what is arguably the best viewing experience on the island, with its high vantage overlooking the coastline and the expanse of blue sea bejeweled with green islands in the distance. The lobby itself is worth a trip, with its high, open ceiling, generous space, oversized birdcage lamps and contemporary art designs. It’s worth mentioning that Serene, the bar in the grand lobby, serves high tea set against amazing views, while downstairs on the deck, Air Bar serves cocktails while your spirit basks in one of the most beautiful sunset spots on Koh Samui. 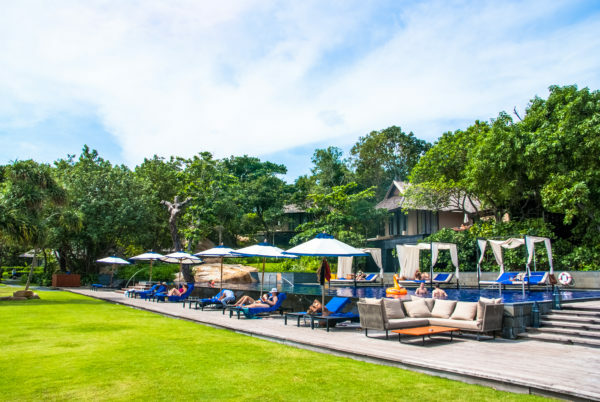 Built on 22 acres of landscaped tropical gardens, Baan Taling Ngam, which means ‘home on a beautiful cliff’ in Thai, comprises 79 rooms, suites and villas and seven swimming pools spread around the resort, a ‘Planet Trekkers’ kids club, and the first exclusive HARNN Spa on the island. While this resort certainly captures all senses, it exceeds in two particular categories: touch and smell. This is due to its exclusive relationship with HARNN, a producer of natural body care, skincare, aromatherapy and home spa collections. The pampering grace of HARNN products is present in the resort’s bathroom amenities as well as at the Baan Thai Spa by HARNN. Baan Thai Spa by HARNN received a World Luxury Spa Award in 2016, and offers an ultimate spa experience that redefines the art of relaxation. Set in a traditional Thai wooden house it provides a comfortable interior which co-exists in balance with the tropical environment. HARNN’s holistic philosophy focuses on creating high quality, all natural spa products to restore the natural balance of body and mind and satisfy your sense of touch and scent. 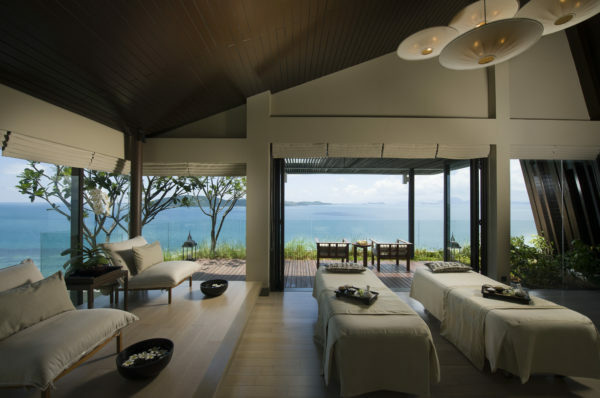 HARNN took over the management of the spa at the InterContinental Samui in 2015, bringing its knowledge of Asian restorative treatments, medicinal herbs, and traditional therapies like Chinese acupressure, Indian Ayurveda and Thai massages, into a full range of spa options, from the various massages to the brand-famous organic spa products. 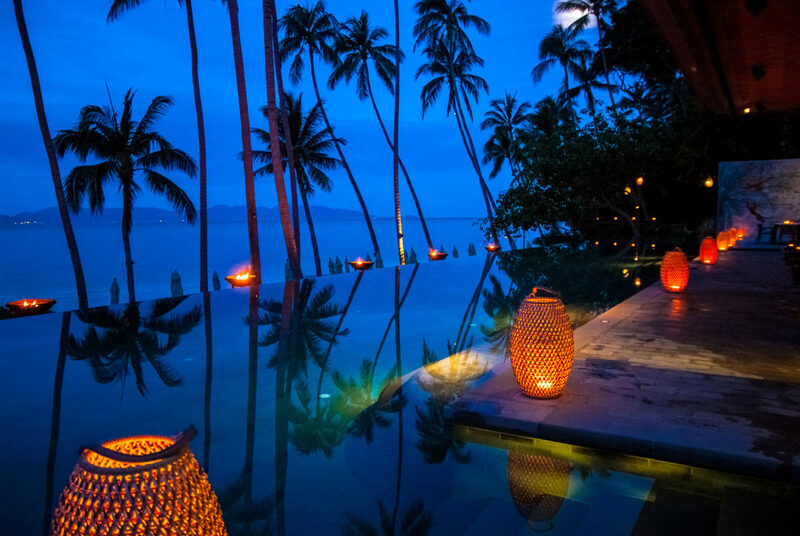 Baan Thai Spa’s signature treatment is the ‘Tropical Samui Passage’, which reflects the history of the island. For centuries coconuts were the mainstay of the island and locals have developed ways of utilizing every part of the coconut. For this signature treatment, fresh coconut is present every step of the way, from the coconut milk herbal bath to the body polish with freshly grated coconuts. For the acupressure massage, coconut shells are used while a warm body wrap melts away any muscle tension. It’s all topped off with a Siamese aromatic massage with cold pressed coconut oil. 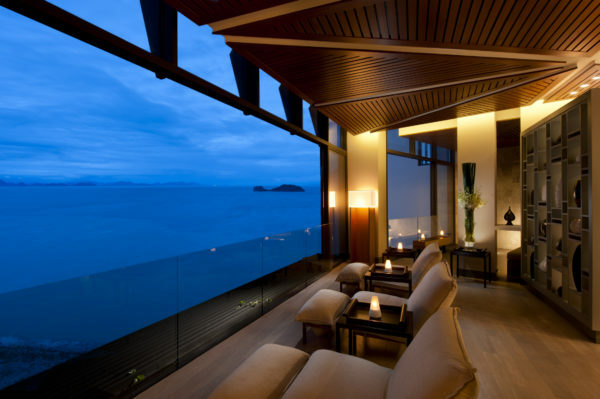 The dining options at the InterContinental Samui range from intimate to opulent. 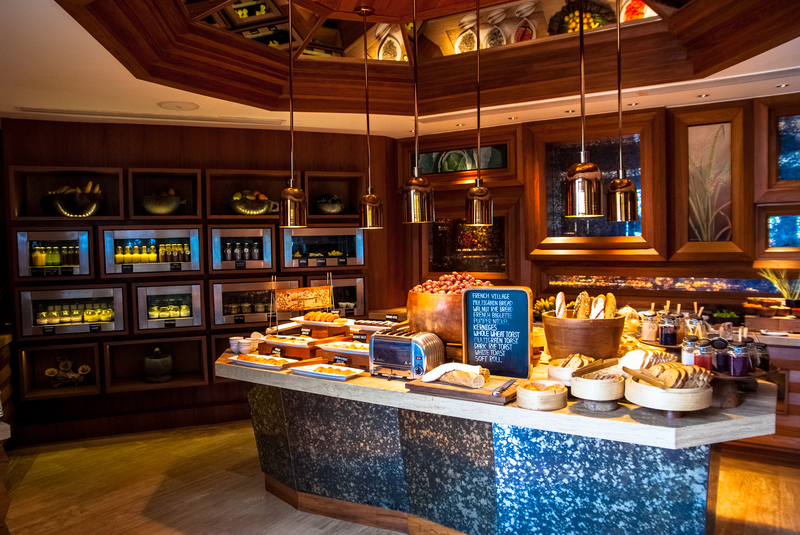 A filling breakfast buffet is served at the hotel’s main restaurant, Amber, overlooking the gulf. Along with the hot foods and fruit bar, there is a live cooking station and a section of healthy juices and smoothies. Lunch is à la carte and emphasises Thai and other Asian tastes, while in the evening they play host to theme night buffets, sometimes with live entertainment such as traditional Thai dances and music. And with the arrival of Chef Paramjeet Singh Bamrah, the resort has introduced the first Indian buffet on the picturesque island and is able to cater to the most elaborate of Indian weddings and festivities. 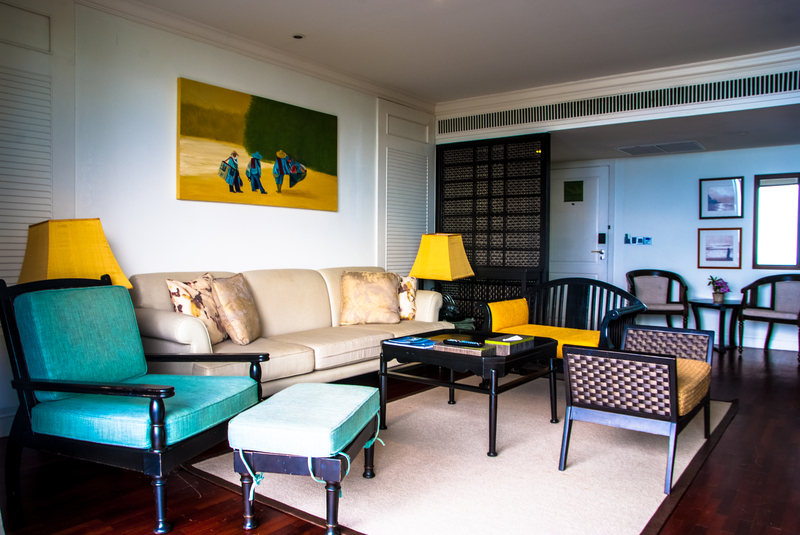 And then there is one final touch – one of InterContinental’s flagship hotels in Asia, the InterContinental Samui Baan Taling Ngam Resort offers guests Club Intercontinental. The service includes a 24-hour personalized butler service, additional in-room amenities, access to a private Club pool, daily afternoon tea and cocktail hour, complimentary breakfast at Amber, and more. 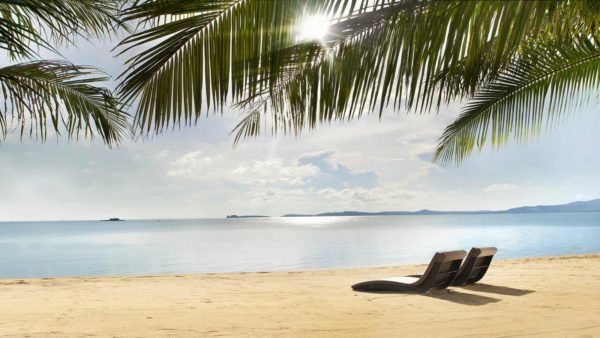 Along with touch and smell, InterContinental Samui, named Asia’s Most Romantic Resort at the World Travel Awards, has imprinted its vision indelibly on our memories. The final destination on this journey into the senses took us beyond our expectations, into a world where a balance of all senses create a complete experience. The Conrad Koh Samui, on the southwest tip of the island, is surrounded by a breathtaking expanse of azure sea and lush tropical forest. 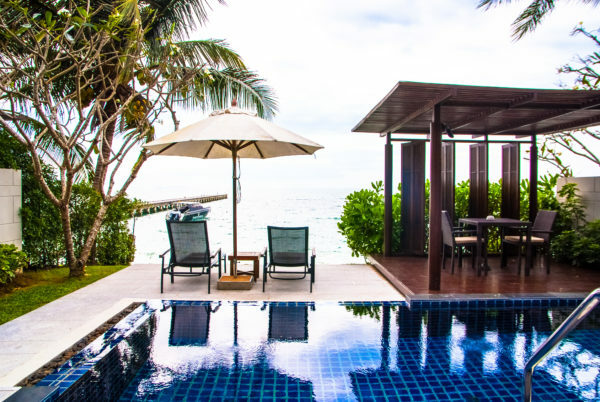 This secluded hideaway takes luxury to the next level, and is one of the crown jewels in the Hilton global portfolio winning the prestigious World Travel Award for Asia’s Leading Honeymoon Resort in 2015. It was also the Regional Winner for Luxury Romantic Hotel in 2016 and the Global Winner for Luxury Hideaway Resort in 2014 at the World Luxury Hotel Awards. The views of the Gulf of Thailand and outlying islands from the lobby are dazzling. The lobby itself is small and unassuming, leaving all the grandeur to the stunning view, and making guests curious as to what lies ahead as they venture onto the grounds of the 25-acre hillside resort which comprises one, two and three-bedroom luxury villas. They stand impressively on tall columns planted firmly into the cliff rock and all come with private pools and decks. The two-story Oceanview Two-Bedroom Pool Villa comprises a spacious 297 square meters designed in contemporary-Thai style. The upper level entry opens onto a lawn with chairs looking out on a spectacular sea vista. Foyer space provides all the comforts of home, encompassing a bright living/dining area with powder room, kitchenette, a dining table for four, and a large L-shaped sofa and coffee table along with an Apple TV entertainment center, Bose Stereo surround sound system, and WiFi. The lower level houses double bedroom suites with king bathrooms, work desks and couches. The master bedroom features a round king bed, a marble bathroom with a huge 360-degree soak tub, and spa-quality amenities for a luxurious bathroom experience. Both bedrooms open onto an outdoor wooden deck with lounge chairs and dining table and a 12-meter long infinity pool that offers both unobstructed sea view and privacy. The dining experience at Conrad is exemplified by the highly rated Jahn, Global Winner of the World Luxury Restaurant Awards 2016. 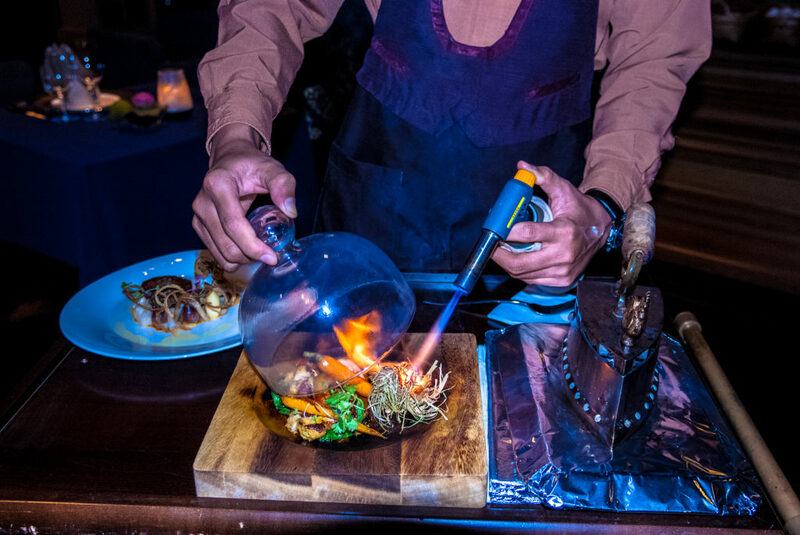 Jahn presents a refined Thai culinary journey in the intimate ambience of a candle-lit dining room, with exquisite wood interiors and seating for 28 guests, with windows looking out on the beautiful gulf. The restaurant Executive Chef Amporn Choeng-Ngam, known as Chef Berm, brings an artistic and innovative approach to fine dining. His labor of love has created a carefully selected menu that pairs the finest vintages with inspiring cuisine. 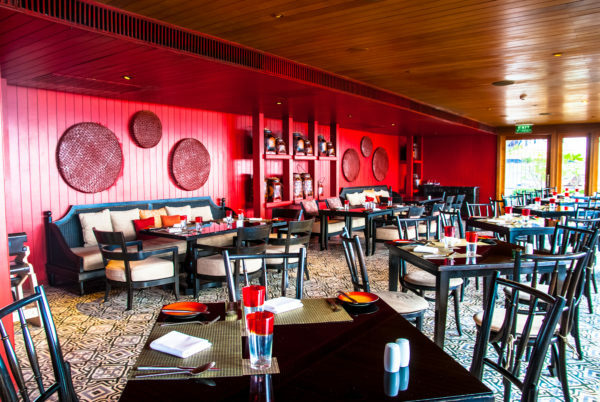 Jahn offers two seven-course menus, Tasting of Jahn and Journey of Jahn. One of many stand-out items on the menu is the Plaa Pla Bai Bua, a seared red tuna with lotus seed and avocado purée topped with Thai herbs, lemon and mint sauce, served on lotus leaf, the line between art and food blurred – the beautiful presentation matches its exquisite taste and texture. Another standout is the Kai Oob Fang, a sous-vide chicken breast with herbs and fresh wheat grain, served with a smoky single malt whisky. Breakfast is served at Zest, Conrad’s casual all-day restaurant, with both indoor and outdoor seating with ocean views. 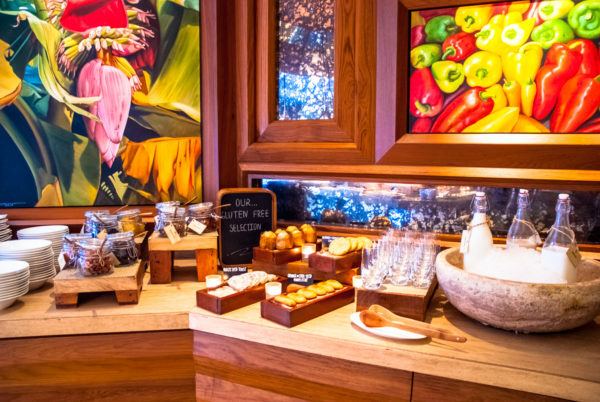 Zest offers an expansive international breakfast buffet flowing into an exciting lunch selection, with vibrant Pan-Mediterranean and classically Thai flavors married to fresh, local, and organic ingredients. For more bodily pleasures, a visit to The Conrad Spa Koh Samui located atop a hill that provides stunning 270-degree panoramic views of an azure sea, is in order. The World Luxury Spa Awards has named this the Best Luxury Wellness Spa in 2013 and 2014 and the Global Winner of Luxury Hideaway Spa in 2016 and we can certainly vouch for that. The Conrad spa experience provides personal attention and the full spectrum of sensory engagement from the setting, the relaxing sounds and wafting aromas, to the precise and thorough touch of master therapists. The ten spa treatments feature private spa plunge pool, over-sized tub and a steam room located in the VIP treatment suite. Guests can relax on the private spa deck overlooking the gulf or nibble on healthy snacks, spa cuisine and juices in the Relaxation Lounge. 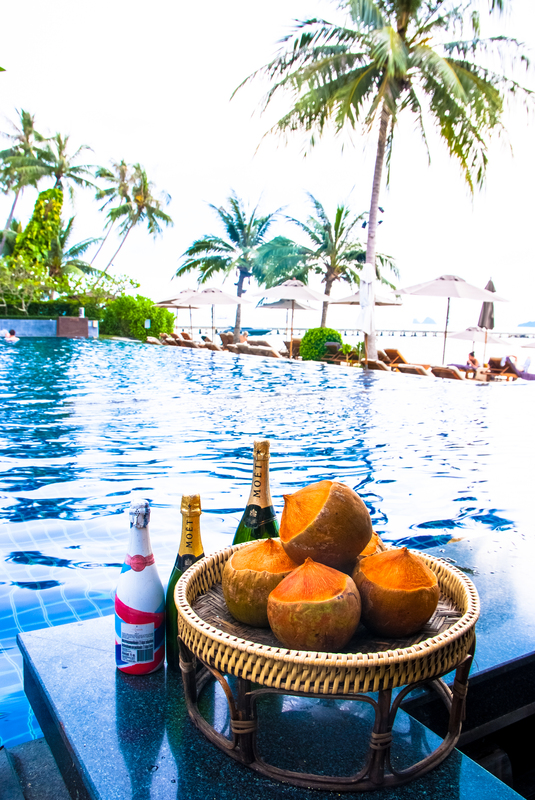 The Conrad Koh Samui puts all its emphasis on guest experience. The resort provides several social venues and activities. Worth mentioning is the huge infinity pool near the beach, and the poolside Azure bar and grill. Aura Lounge, perched high above the resort against a large rock wall, is the perfect place for sunset cocktails. One can also reserve in advance for speedboat day excursions to nearby islands and diving tours, designed to make hearts beast faster. It’s pure luxury, for all senses and in every sense of the word. Words by Nigel D’Sa, Photos by Vincent Sung.